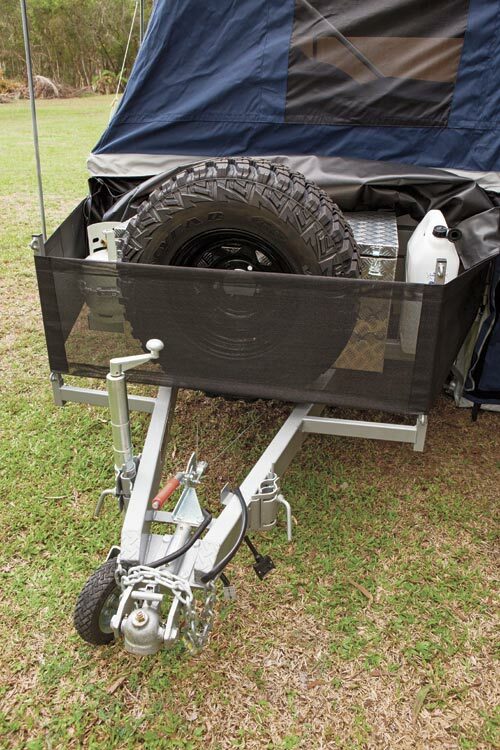 The Offroad Tourer adds an even more popular element to the Johnno’s Camper Trailers range, a walk-up. It’s not a new idea by any stretch but it sure adds appeal and sensibility. The main trailer is a rugged 50x50x2.5mm DuraGal with 100x50x3 mm DuraGal drawbar. Out front is a recessed Hyland Offroad 50mm ball coupling and handbrake, while underneath are very strong nine-leaf rebound springs with a 45mm solid square axle and 10in electric brakes. 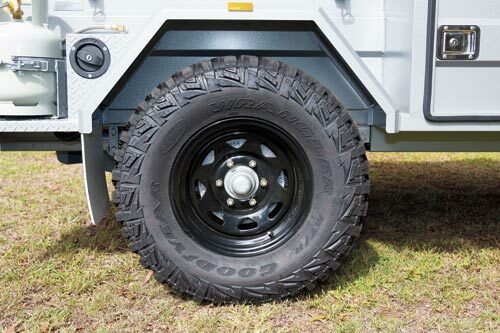 Carrying the load is a pair of black, powder-coated Sunraysia steel mags with 15x7in Goodyear Wrangler AT tyres with Kevlar reinforced side walls. The tub body itself measures 2080x1275x500mm and is made from 1.6mm pressed Zincanneal sides and the whole shebang is painted in an attractive enamel hammertone light grey finish. On the back are LED tail lights and a fully engineered tow coupling mount. Down the driver’s side there is an access hatch at the front that takes you directly into the walk-up storage area — a handy place to keep a couple of folding chairs for those cuppa breaks on the road. The kitchen can also be accessed from the rear tailgate. 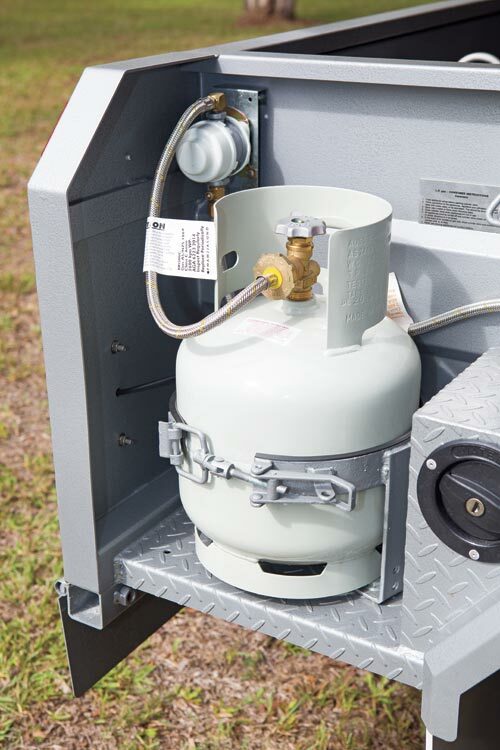 There’s more storage in another enclosed hatch and a further gas bottle mount at the rear next to the water filler. 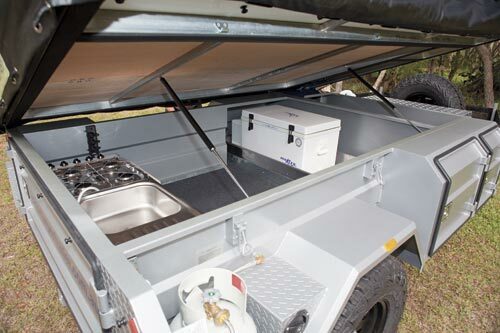 On the passenger side the walkway access is at the front, then another lockable hatch for an optional 60 or 85L EvaKool fridge/freezer complete with some quality stainless steel slide tracks to handle the weight. The rear left hand compartment houses the electrical heartbeat of the Johnno’s. 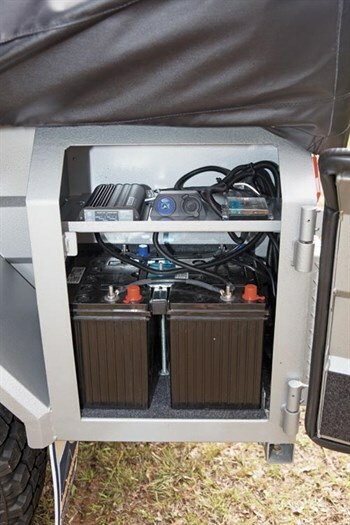 The bottom shelf has a pair of 75Ah deep cycle batteries fed by an Anderson plug as standard. 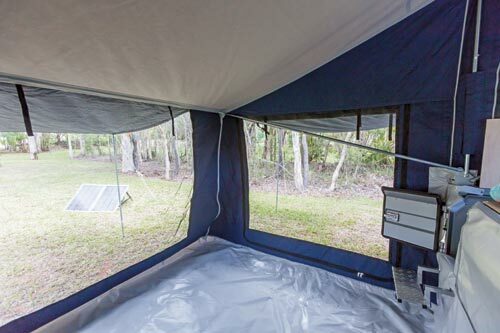 There are more 12V outlets in the tent at the bedside, as well as three more in the tub near the kitchen. The added length in the tub body translates to a larger 2.7x2.7m internal living area. 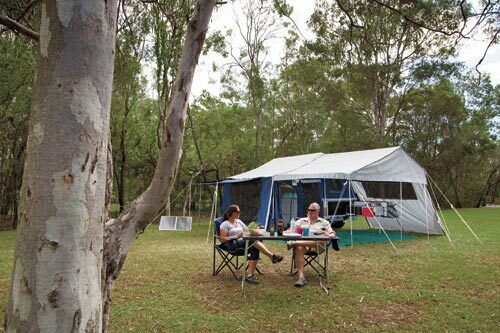 The main tent folds over quite easily and stands directly with minimal fuss from a rather strong support frame. The Wax Converters canvas is terrific. It has a 15oz roof and 12oz sides with quality midge mesh flyscreens and solid zips. There is a single doorway (you’ll probably need to duck slightly to enter), and once inside there’s a large expanse of light and airy accommodation. There are plenty of windows and Johnno’s can opt up a detachable kids room/spare bedroom off the zip-out back wall. It’s a simple but efficient affair made from a combination of stainless steel bench tops, sink and drawers combined with enamel painted Zincanneal casing. For stability there is a sliding support leg with thumb screw lock that keeps the unit stable. There’s a Thetford four-burner stove with separate grill, which is a great way to cook for the masses quickly. There is no hot water as standard and only a manual pump-up tap for the cold. It’s basic but it works. 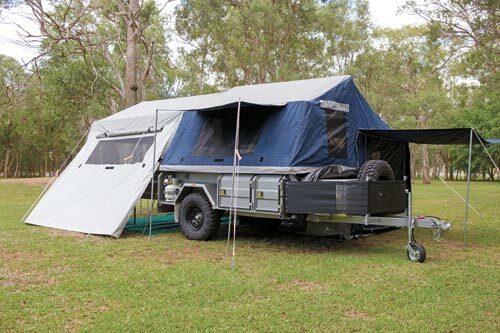 All in all, the Johnno’s Offroad Tourer Walk Up offers good ol’ traditional value with a very high standard of manufacture and componentry. 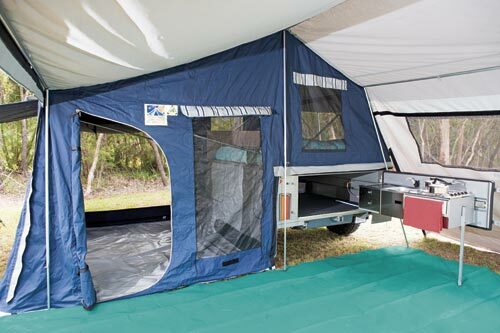 This review appeared in issue #78 of Camper Trailer Australia magazine, July 2014. Why not subscribe today for all the latest camper trailer news, reviews and travel inspiration. 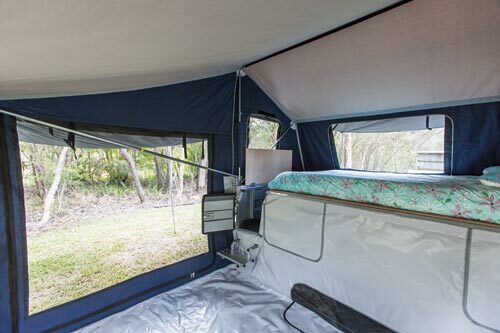 Find new Johno's Camper Trailers campers for sale online. 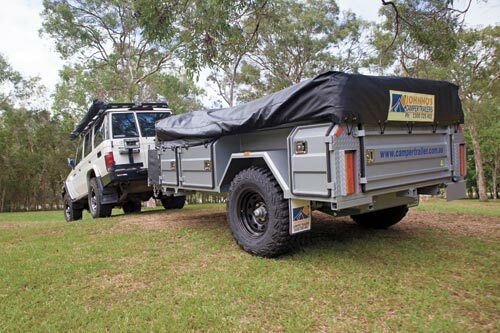 Buy and sell old and new camper trailers online at TradeRVs.com.au.